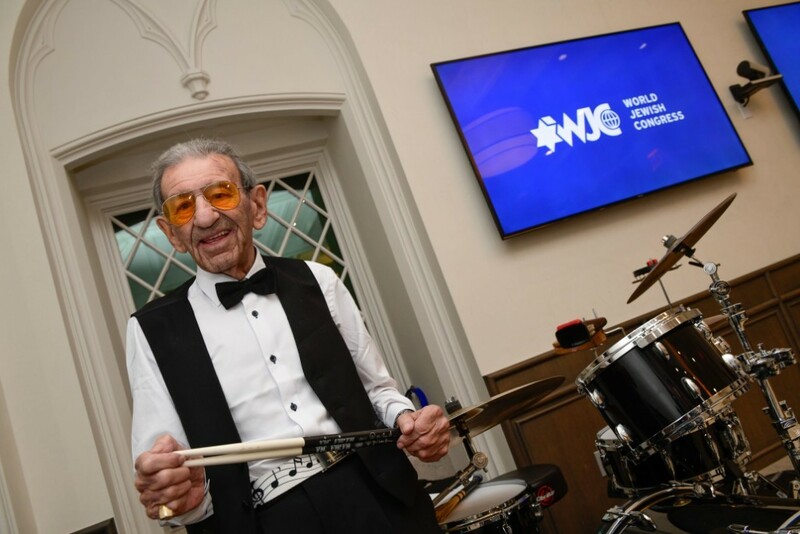 New York, NY - On Wednesday night, the World Jewish Congress hosted an event featuring the Holocaust Survivor Band at the Ronald S. Lauder JNF house on New York’s Upper East Side. The Holocaust Survivor Band was founded by 93-year-old survivor Saul Dreier in 2014 who decided to start a klezmer group in south Florida to revive the songs he grew up listening to in Krakow, Poland before the Second World War. During the Holocaust, Dreier was a prisoner in the Krakow-Plaszow and Mauthausen concentration camps where he was considered to be “rich” because he possessed two spoons which he would hit together during his nights spent in the camps’ barracks. The group quickly launched into klezmer versions of Hava Nagila and other Jewish classics. Holocaust survivors could be seen mingling and dancing with younger attendees. Recent college graduates could be seen enjoying the same music and sharing stories with 90-year-old Holocaust survivors. The event was also marked by other distinguished guests who spoke about the importance of Holocaust remembrance including Kimberly Mann, chief of the Education Outreach Section in the Outreach Division of the United Nations Department of Public Information which encompasses the UN’s Holocaust Outreach Programme. Mann received praise from WJC North America Chair Evelyn Sommer, who also spoke about WJC’s groundbreaking initiatives to spread awareness for the Holocaust and combat antisemitism through digital media. WJC General Counsel Menachem Rosensaft also delivered remarks about the new Holocaust education site recently launched by the World Jewish Congress together with UNESCO to educate youth across the globe on key issues regarding the Holocaust. The upbeat evening was capped off with all the attendees chanting “never again” and taking a “WeRemember” photo with the Holocaust survivor band, who, while in New York, will be filming a promotion video for the WJC’s annual #WeRemember campaign for of International Holocaust Remembrance Day, observed each year on January 27. In 2018 the campaign reached over 650 million people, making it the largest Holocaust remembrance event in history.